« Can Mother Nature be Ravens' 13th (wo)Man vs. Saints? Filling out the rankings chart (above) is getting to be a bit depressing. As the weeks rolled on, I really expected the Ravens’ offense to inch closer and closer to being a top 10 unit. Instead, even after playing the lowly Houston Texans and their 31st ranked defense, the Ravens dropped in every offensive category when compared to last week. They did go from the #17 scoring team to the #14 scoring team, but as we know, the special teams and defense had as much to do with that as the offense did. At least, though, the most important number – wins – moved in the right direction. However, it’s still a little disheartening that the offense continues to struggle as much as it does. Thinking that they can find a quick answer down the stretch seems to be becoming more of a…well, stretch. This week, the defending Super Bowl Champs roll into Charm City, winners of six consecutive games. They’ve also put up 30 or more points in five straight games, which gives Ravens fans a nice pre-holiday case of indigestion after watching the Texans rack up 21 second half points on Monday night. Upon further review though, it’s not like the Saints have been hanging 30 on the ’85 Bears. Their recent 30 point outputs have come against the Rams (15th in points allowed), Bengals (28th), Cowboys (31st), Seahawks (24th), and Panthers (26th). Even after blowing their first 21-point lead since 1997, the Ravens much-maligned defense is still fourth in the NFL in points allowed. Throw in a healthy dose of the elements, and this game should be far from the shootout that many are predicting/fearing. Which isn’t to say that Drew Brees and his stable of big play wideouts/backs doesn’t present a formidable challenge. Brees is playing as well as any quarterback in the NFL right now, and is just the type of “elite” signal-caller that the Ravens have struggled time and again to find a way to beat over the past five years or so. If Brees has one chink in his armor this season, it’s been the interception. “Breesus” has already been picked 18 times, tying his career high. That’s 3.4% of his throws that are being intercepted, highest since his third season in the league in San Diego (for comparison, Joe Flacco’s INT percentage this year is 1.9%). When the Ravens last played the Saints in 2006, they picked him off twice and both were returned for touchdowns. After four interceptions in his first four games back off the PUP list, Ed Reed hasn’t gotten his hands on a pass in three straight contests. Sunday would be a great time for Reed – who looked slow, old, and hurt at times Monday – to come alive again. When you think New Orleans, you think offense. However, their defense is none too shabby either. After leading the NFL in turnovers a season ago, which helped mask their 25th-ranked defense, this year’s Saints have been much more consistent – at the cost of the turnovers – on that side of the ball. They currently sit as the #6 defense in the NFL, allowing just 308 yards per game. They’ve intercepted just nine passes though, four shy of the Ravens’ 13, and 13 less than the Philadelphia Eagles’ league-leading 22 picks. Even more concerning than their inability to run the ball lately, has been the Ravens’ pass protection. Joe Flacco has been sacked 32 times now, and an incredible 22 of those have come in the six games since the bye (3.67 sacks per game). The Saints are right in the middle of the pack in sacks, with 26 (the Ravens have 24). Defensive Coordinator Gregg Williams, who never met a blitz he didn’t like, was surely licking his chops this week looking at film of the Ravens’ inability to stop a rushing safety. That’s right, even after Cam Cameron assured us that whatever breakdown in protection allowed Troy Polamalu to steal the Pittsburgh game from them was fixed, Houston safety Bernard Pollard came untouched over and over Monday night on his way to 1.5 sacks. WTF, Cam? WTF, Matt Birk? WTF, Michael Oher? Fix it, please. On the bright side, the Ravens’ special teams have been playing lights out lately. Rookie David “Cop Speed (cuz you got weed)” Reed now leads the NFL in kick return average after his franchise record 103-yard touchdown return last week. He also had an 84-yard return against Carolina. Billy Cundiff is now just three touchbacks shy of tying an NFL record. Sam Koch (more like Sam Kick, am I right?!) was incredible Monday, dropping 5 punts inside the 20-yard line, including the crucial one in overtime. He leads all punters with 34 placed inside the 20. Winning the field position battle will go a long way towards a Ravens win on Sunday. The New Orleans Saints may be the best team the Ravens play all year (New England would be a close second, but they weren’t playing their best football in Week 6 when the Ravens saw them). Playing them on a neutral field (let’s hope that happens in early 2011) would be a very daunting task, but the home field should really benefit B’More this week. The Saints are a very good road team, but the Ravens are even better at home. They owe the fans one after pooping away the last home game in the final minutes. 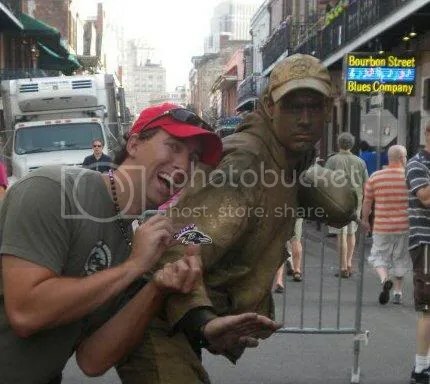 I met this guy – “The Sidewalk Saint” – in the Big Easy last summer. Here’s me showing him what’s what. Let’s hope he remembers me on Sunday, and shakes his fist angrily at the sky after a Ravens win. This entry was posted on December 17, 2010 at 10:20 am and is filed under Ravens, Ravens Game Previews. You can follow any responses to this entry through the RSS 2.0 feed. You can skip to the end and leave a response. Pinging is currently not allowed. Curse those likable New Orleans Saints, who the only thing bad you can say about them is that their second string Running Back took money at USC. Really Matt Ryan is Captain Checkdown he average 6.6 yards per pass which is 24th in the NFL. While Flacco average 7.4 yards per pass which is 9th.